NBC wanted Jon Stewart to host Meet the Press. 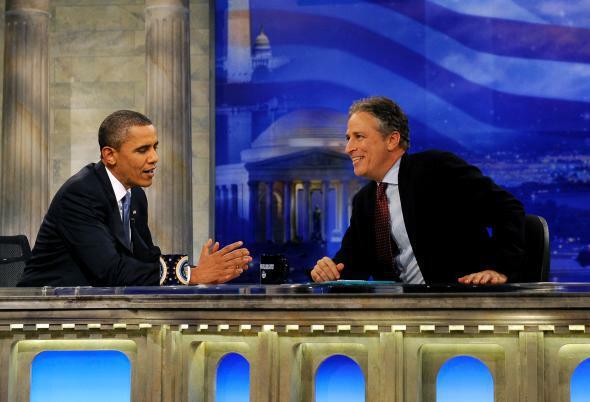 Jon Stewart interviewing President Obama in 2010. The Daily Show and Meet the Press exist in different TV schedule galaxies. One’s a late show, the other early. One program is a comedy; the other is not a comedy. Despite these differences in style and delivery, NBC News execs made a run at spicing up the Sunday morning wonkfest that is Meet the Press by hiring none other than Jon Stewart as anchor. NBC’s courting of Stewart earlier this year for the job that is now occupied by Chuck Todd comes via New York Magazine. Todd, who ended up getting the nod to replace David Gregory, responded (sort of) to the news of NBC’s Stewart affair with his very own dollop of humor.